These pictures show Ealing Broadway station. There’s still a lot of work to be done, to make the station, look like Crossrail’s image on the hoarding. These are the proposed train frequencies at the station in the Off Peak, when Crossrail opens. Four trains per hour – Great Western Railway. Ten trains per hour – Crossrail. There will be extra services in the Peak. But the design does look that it will enable the station to be rebuilt, whilst trains are still calling at the station. As current rumours are that Crossrail will open in December to Reading, they had better have got it right. After my trip to Beaconsfield station, which I wrote about in Beaconsfield Station To Go Step-Free, I needed to get to West Ealing station. So I took a direct train to South Ruislip station, where I changed to the Central Line for Greenford station and the Greenford Branch to West Ealing. These pictures show the subway at South Ruislip station. It is a subway with inadequate steep steps. According to the Wikipedia entry for Chiltern Railways, one of their active plans is for a Chiltern Metro. This is said. New Chiltern Metro Service that would operate 4+tph for Wembley Stadium, Sudbury & Harrow Road, Sudbury Hill Harrow, Northolt Park, South Ruislip and West Ruislip. This would require a reversing facility at West Ruislip, passing loops at Sudbury Hill Harrow, and a passing loop at Wembley Stadium (part of the old down fast line is in use as a central reversing siding, for stock movements and additionally for 8-car football shuttles to convey passengers to the stadium for events). So there could be four trains per hour (tph) through South Ruislip station, in addition to the current hourly service to High Wycombe. When Chiltern Railways have a second London terminal at Old Oak Common station, there could be more stopping trains. There is also pressure to run services along the Greenford Branch to West Ruislip and High Wycombe. The Central Lione will be getting new larger trains in the next few years. There is certainly, a lot of potential to improve services and South Ruislip station could need to go step-free. Putting lifts into the subway to access platforms has been done many times and wouldn’t be the most major of projects. Whether it is worth doing, would be solely down to passenger numbers. Currently, the station handles about two million passengers per year, most of whom are using the Central Line. There will probably be a lot of new housing built in the next few years. With the disruption of building High Speed Two, through the area, this might mean new passengers start using the station. I predict that South Ruislip station will go step-free. Motorists on the UK’s most congested road spend an average of two and a half days a year sitting in traffic. The section of the A406 between the Hangar Lane Gyratory and Chiswick Roundabout has always been a dreadful road to drive on, as long as I can remember. These pictures show typical traffic around eleven o’clock in the morning. There does seem to be rather a lot of private cars and small commercial vehicles, with only a few HGVs and buses. I would love to see an analysis of where these journeys start and finish. Converting the road to a multi-lane dual carriageway wouldn’t be possible, as much of it is lined with private houses and even if it could be built it would just attract more traffic and would need to be widened even more. There are circular routes further out of London like the M25 and the A412, but this road is an intractable problem. Perhaps, it needs to be in a Congestion Charge Zone? But is a solution at hand? Crossrail, if and when it opens, will not be a direct solution, as it goes East-West and not North-South like the A406 through the area. But it will give better access to Heathrow, which is a large traffic generator in West London. Crossrail will link the following to the Airport. It will do little to help those in North and South London to travel to and from the Airport. The connection of High Speed two and Crossrail could make a difference. Passengers using High Speed Two travelling to and from Heathrow, would have an easy route. North and North-East Londoners will be able to use the North London Line with a change at Old Oak Common. South Londoners will be able to use the West London Line with changes at Old Oak Common and Clapham Junction stations. But Old Oak Common station won’t open under 2026 at the earliest. It also does nothing for those travellers in wide swathes of North-West London. If there is a trusty knight on an immaculate white charger, coming to the rescue, it could be the West London Orbital Railway, although as it would be stitched together from parts of existing and underused infrastructure, it has more of the Dirty Dozen about it. There would be two routes. West Hampstead Thameslink and Hounslow via Cricklewood, Gldstone Park, Neasden, Harlesden, Old Oak Common, Acton Central, South Acton, Brentford, Syon Lane and Isleworth. Hendon and Kew Bridge via Brent Cross West, Gldstone Park, Neasden, Harlesden, Old Oak Common, Acton Central and South Acton. The project has various advantages. No substantial amount of new track will be needed. It could be run using battery-powered trains. Costs would be well under half a billion pounds. It would connect to Thameslink and Bakerloo, Jubilee and North London Lines. 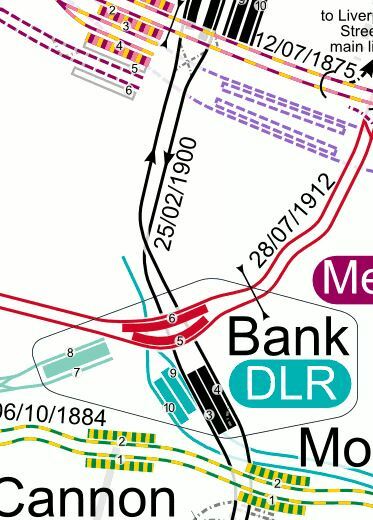 When Old Oak Common and High Speed Two open, it would have a direct connection. I wrote about this railway in detail in New Railway Line For West London Proposed. As stated under Development in the Wikipedia entry for North Acton station, there may be reasons to rebuild the station to create a connection between the North London and Central Lines. 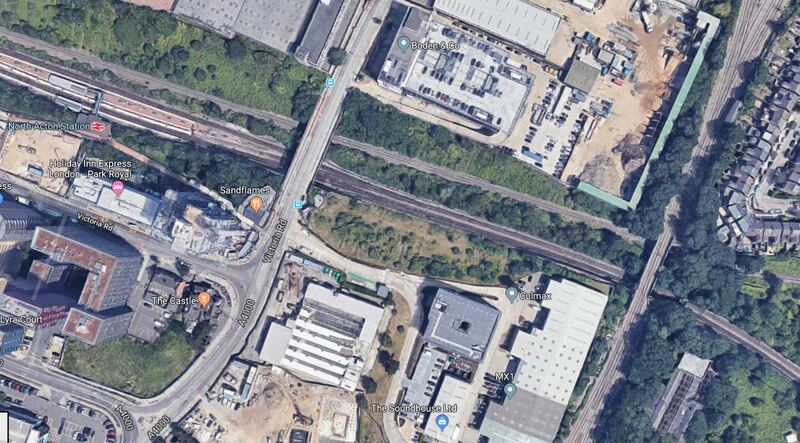 This Google Map shows the area around North Acton station. North Acton station in the North-West corner of the map. The North London Line running North-South to the right of the map. The Dudding Hill Line branches off the North London Line at the top of the map. The Central Line running East-West through North Acton station and under the North London Line. Threading its way through North of the Central Line is the Acton-Northolt Line. The Acton-Northolt Line could be developed by Chiltern Railways to give access to a second London terminal at Old Oak Common. To develop a successful station at North Acton, that tied everything together would be a hard ask. The bridge carrying the North London Line is very high. The height would make step-free access expensive. The frequency of trains on both the North London and Central Lines could be twelve trains per hour (tph). At least, there does appear to be plenty of space from the map. On the other hand, an architect with vision might be able to create a station that was affordable and provided high benefits for passengers. There’s certainly potential in West London to improve the rail routes, although I’m not sure whether rebuilding North Acton station would be viable. But, we should start building the West London Orbital Railway immediately. I’m writing this post for two reasons. The first is to inform people that in the Summer of 2021, there is going to be a closure of the Bank Branch of the Northern Line for several months. The second, is to illustrate, how in a large transport system like London, good project management can carry out major works, without too much inconvenience to passengers. This article on IanVisits is entitled Behind The Scenes At London Underground’s Bank Tube Station upgrade. I suggest you read the article, to get the scale of the project. In the Summer of 2021, a section of the Bank branch of the Northern line will close for roughly 3 months. The main reason is so that the New Southbound tunnel can be joined to the existing Southbound tunnel, North and South of Bank station. Think of it as installing a by-pass round a village. Except it’s a railway and it’s around forty metres below ground. Ian says this about what else will happen, whilst the Northern Line is closed. While that’s going on, at Bank station, the old southbound tunnel will have it’s tracks filled in and turned into a new large concourse, while the currently hidden new side passages are cut through into the old northbound platform and finished off. Come roughly September 2021, after a few months of closure, people will arrive at Bank station and see these huge new tunnels, the new escalators down to the DLR, the travolator to the Central line. This approach is very common on the railways. If a line has to be closed completely for a few months, say because a tunnel is being repaired, then during the closure, you do all the other tasks you can. At Bank, where a new track is being connected, there will be no trains through the station for a few months. So all the other jobs will be done in this window. There may also be other advantages. At Bank station, the Northbound track itself is not being radically changed, so it might be possible to use battery locomotives to bring in supplies and take out rubbish. Project Planners have calculated and it will probably take until the end of 2020, for everything to be ready before the closure can take place, so that the joining of the tracks can begin. But there could other reasons, for the 2021 date. Bank station is an important station on the Northern Line and closing it will cause a lot of inconvenience for passengers, many of whom will still be commuting to the City of London. Before Summer 2021, these big projects should have been completed. One completed on Friday, when the new Bank Station entrance on Walbrook opened. Crossrail will have opened.. On current forecasts nearly two years earlier. The Northern City Line will be running new Class 717 trains into Moorgate station. Travellers will have learned to use Thameslink as part of the Underground. All of these projects will help passengers to cope with the Northern Line Closure at Bank station. Bank station will not be fully-closed. The Central Line will be working at Bank station, to something like full capacity. The Waterloo & City Line will be working normally using the new Wallbrook entrance. The Docklands Light Railway will be working, as is possible around all the work. Some new and refurbished routes will connect the Central Line and Docklands Light Railway to the myriad station entrances around Bank Junction. The Circle and District Lines will be working normally, through Monument station. In addition, the City of London will have improved walking and cycling in the Square Mile. Where Will Northern Line Trains Run During The Closure? For a start, all Northern Line trains through Charing Cross station will be running normally. The Northern Line Extension to Battersea might even have opened, which would give an extra Southern terminal to the Northern Line, which would help operation of the Charing Cross Branch. Looking at the detailed tracks on carto.metro.free.fr, it appears that trains from the North can turn back at Euston and Moorgate. Euston will be in the throws of rebuilding for High Speed Two. The Northern Line is the preferred route between Euston and the City. Moorgate will be a fully step-free rebuilt station with connections to Crossrail and the Central Line. Many people can walk to most parts of the Square Mile from Moorgate. It looks to me, that it is most likely that Northern Line services will terminate at Moorgate during the closure of the Northern Line through Bank. Northern Line trains approaching the City from the South have no such convenient turn back between Kennington and Bank stations. I think the best direct service passengers from the Morden Branch to the City can expect will be a not-very-frequent shuttle service to London Bridge. Most who need to go to Bank station from the South will find alternative routes and there are several. Travel to London Bridge and walk across the river. Change to the Waterloo and City Line at Waterloo. Change to the Circle and District Lines at Embankment. Change to Crossrail at Tottenham Court Road and walk from Moorgate. It should also be remembered, that as the closure is taking place in the Summer holidays, travellers should cope. As Project Managers always seem to say. You must get your ducks in a row! So in this example, I would have felt that to have rebuilt Bank station without completion of the following projects. Would have been a lot harder. This example also means that you must get your large projects in the right order, so they help each other to be delivered on time. London has several large station interchange projects in the pipeline. Which I believe should be done in the optimal order, so that travellers suffer the least disruption. Smaller projects like a second entrance At Walthamstow Central station should probably be done at a time, when money and resources are available. 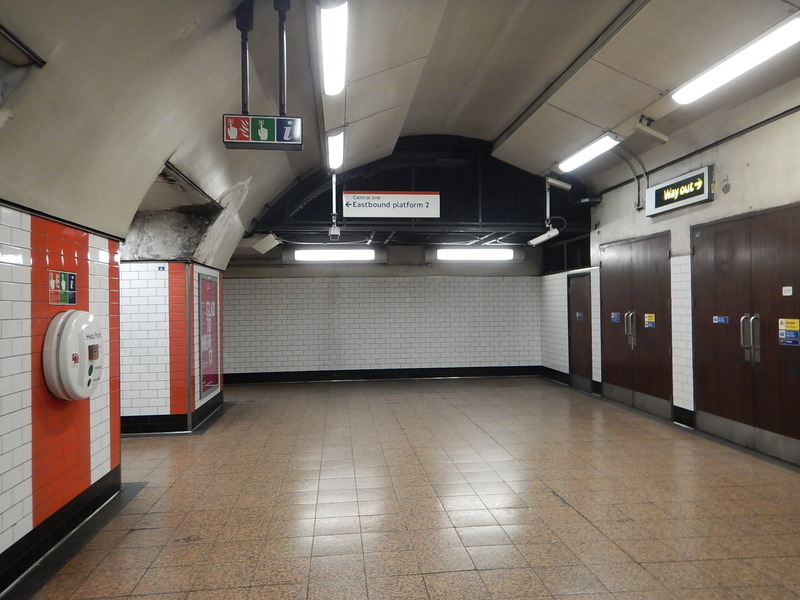 Has The Possibility Been Created For A Pedestrian Tunnel Between Bank And Moorgate Stations? 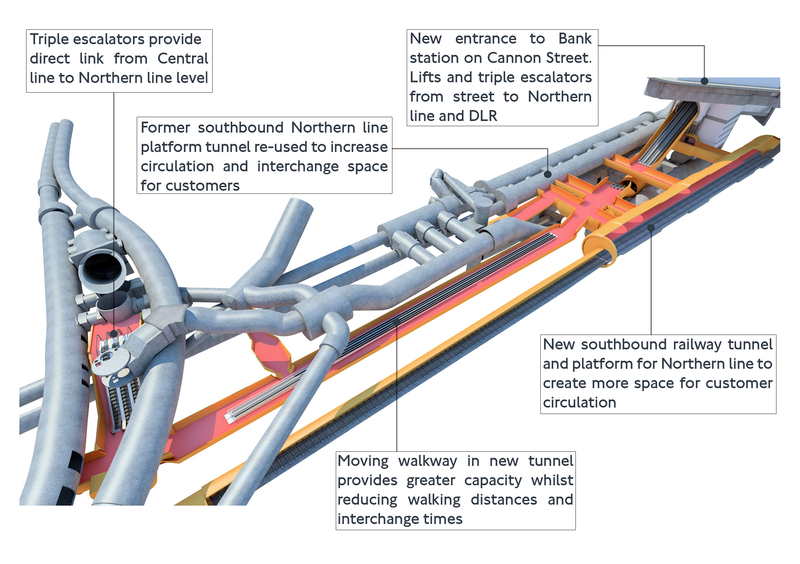 This visualisation shows the Bank Station Upgrade at Bank station, which is now underway to sort out the station’s problems of capacity and poor step-free access. This is the bottom-left corner of the visualisation. Notice that there are two fat tunnels running top to Bottom across the visualisation, which are the Central Line tunnels, with the Eastbound on the left and the Westbound on the right. There are also four tunnels running left to right across the visualisation. The top one is the Northbound tunnel going to Moorgate station. The other one is the current Southbound tunnel, which under the plans for Bank station will be closed to trains and used to improve passenger access to the Northbound platform. If you go to the Northern Line platforms, there are tell-tale blue hoardings, indicating where better access will be created. These pictures show the current state of the current Southbound tunnel. It looks like at least three sections of the wall between the two platforms will be removed. The third tunnel, which is shown pink in the visualisations is the connecting tunnel between the Central Line and the new entrance to the station on Cannon Street. it connects to a lobby, where there are triple escalators to the Central Line. It appears to come to a stop under the Eastbound Central Line platform. What lies at the Northern end of this tunnel? The fourth tunnel, which is the new Southbound running tunnel for the Northern Line, has been helpfully drawn with a rail track inside. This is the top-right corner of the visualisation. There are three cross passages between the two running tunnels, just as there appears to be three blue hoardings in the existing Southbound running tunnel. The Northbound running tunnel now has a wide platform, which has been built inside the existing Southbound tunnel. The new Southbound running tunnel will be built with a wide platform. There are three escalators leading to the new Cannon Street entrance. This map from carto.metro.free.fr, shows the layout of lines at Bank station and between Bank and Moorgate stations. The Central Line is shown in red. The Northern Line is shown in black. 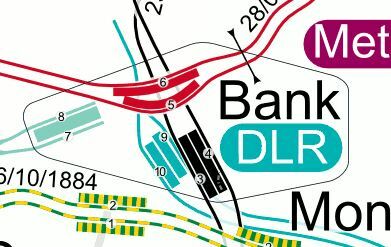 The DLR is shown in turquoise. The two Northern Line tracks cross to the North of Bank station. The lines at Moorgate station are shown at the top of the map. Crossrail is shown in violet. The new Southbound tunnel will be created to the West of the DLR platforms. I suggest you read the article and I feel, you will get the impression the Bank Station Upgrade is a very difficult project, that is being achieved in an innovative manner by the contractors. In one section, the article describes how they are actually building the new Southbound tunnel, through the piled foundations of existing buildings. I now feel I can answer the question in the title of this post. 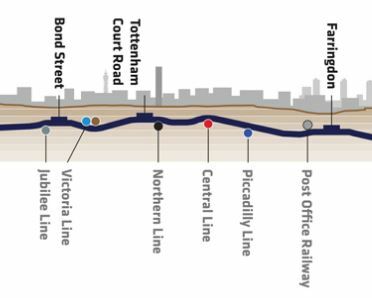 If the route started at the Northern end of the long connection tunnel with the travelator at Bank station, a route could probably be found on the West side of the Northern Line to break-in to the basement of the Crossrail station at Moorgate station. 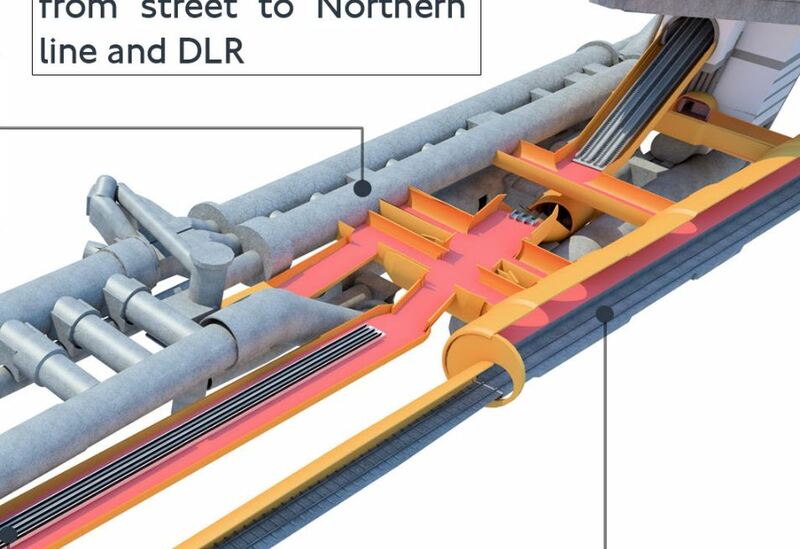 This image shows a cross-section through the Moorgate Crossrail station. Note that under the escalators leading down from the Moorgate Ticket Hall to Crossrail, are a pair of circles. These are the Northern Line running tunnels. A travelator tunnel would be at this level but perhaps twenty or more metres to the West (left in the cross-section). With modern design and construction techniques, I would expect that a connection could be made. I estimate that the travelator would be between three and four hundred metres long. As there are longer travelators either built or in planning in the world, I suspect, the length wouldn’t be a problem. By comparison, these are example travelators in London. Jubilee to Northern/Bakerloo Lines at Waterloo – 140 metres. 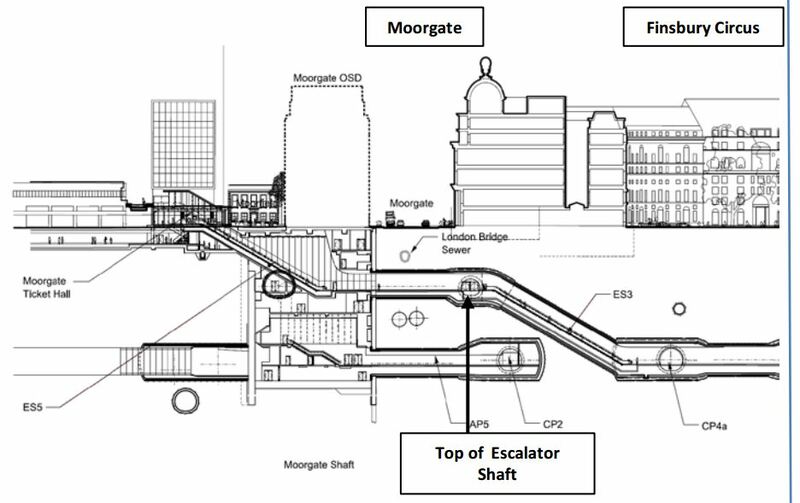 A travelator between Bank and Moorgate stations would probably be, the longest in London. If you read the IanVisits article, it details how the new Northern Line and travelator tunnels at Bank station were excavated. I suspect similar techniques could be used to build the new tunnel. The biggest problem would be removing the tunnel spoil and I suspect that if the tunnel were to be built, when a building on the route needed to be replaced, this would make construction a lot easier. 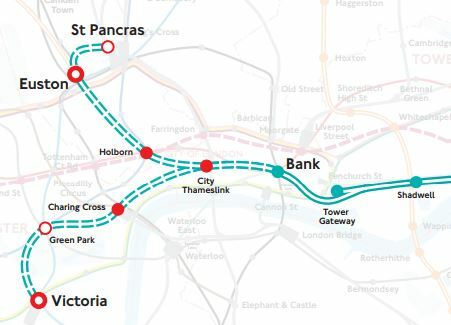 The main argument for building the tunnel is that it would connect Bank station directly to Crossrail. There are various reasons, why the travelator may not be needed. The City of London is in favour of pedestrianisation and has already disclosed plans to make Bishopsgate, which is one of the most important North-South arteries through the Square Mile, much more pedestrian friendly. I would expect more initiatives like this to follow. So many travellers will use their feet on the surface, between Crossrail and Bank, when the two stations are completed. The connections to the Northern Line will be improved at both Moorgate and Bank stations, when Crossrail and the Bank Station Upgrade are completed. So those travellers needing or wishing to do a one-stop transfer, will find it easy. Crossrail and the Central Line have good connectivity. Stratford – A cross-platform interchange. Ealing Broadway – A step-free connection. If travellers need Bank and they are coming from either direction on Crossrail, they can change at a convenient station. Given that Bank station will have a large number of step-free entrances after the Bank Station Upgrade is completed, I suspect many Crossrail passengers will transfer to the Central Line to avoid the walk from Moorgate or Liverpool Street stations. It may be feasible to build a trevelator between Bank and Moorgate stations, but developments already in hand, may give the project a very bad financial case. Crossrail and the Central Line have a cross-platform interchange at Stratford. I turned up today, with trains in both platforms. There needs to be more interchanges like this between different lines, around the UK. I can’t think of many. Highbury & Islington – Northern City and Victoria Lines. Wembley Park – Metropolitan and Jubilee Lines. I don’t know of one outside the London area. What Will Be The Operating Speed Of The New Tube for London? Transport for London have said that the New Tube for London will definitely be deployed on the Piccadilly, Central and Bakerloo Lines. These three lines have sections at one or both ends, where the lines run through the countryside and the stations are farther apart. Only the 1992 Stock of the Central Line have their operating speed given in Wikipedia.. It is 62 mph, which is the same as the S Stock for the sub-surface lines. The 2009 Stock of the Victoria Line, despite being similar to the S Stock have an operating speed of only 50 mph. Because of the nature of the ends of the Piccadilly, Central and Bakerloo Lines, will 62 mph be the optimum operating speed for these trains. I’ll look at the factors on these lines separately. The Piccadilly Line will be self-contained, after the sorting of the shared sections West Rayners Lane and between Ealing Broadway and Acton Town, that I discussed in Thoughts On The Power System For The New Tube for London. I suspect the operating speed of the New Tubes for London on the Piccadilly Line, will be decided on what is best for that line. The Central Line is also self-contained and the best operating speed for the line will be chosen. The Bakerloo Line could be a problem, as currently Class 378 trains run on the same trcks. These have an operating speed of 75 mph. These Class 378 trains will be replaced by Class 710 trains, which could have a faster performance. Surely for optimum running, the trains should need similar performance. On all the lines on which New Tubes for London will operate, there will be Automatic Train Control. The operating speed will be set by the control system, whereas the maximum operating speed will be set by the trains design. So I think we could see a maximum operating speed of 75 mph or even higher for the New Tube for London, so that it could run on faster lines and not slow the other faster trains. To go faster, you probably need more powerful trains, but the motors required would give better acceleration and braking, that would speed up services, by executing station stops in a shorter time. I would expect from y Control Engineering training, that the New Tube for London could have a maximum operating speed in-line with the Class 710 train. So around 75-90 mph. Could we even see an Underground train, that is capable of 100 mph? It would only rarely, if ever, run at that speed on current plans, but it might enable Underground and National Rail services to share tracks in surprising places. This article on the BBC is entitled Crossrail Delay: New London Line Will Open In Autumn 2019. London’s £15bn Crossrail project is to open nine months after its scheduled launch to allow more time for testing. I spent most of my working life, writing software for the planning and costing of large projects and despite never having done any serious project management in anger, I have talked to many who have, both in the UK and around the world. The project involves the following. A 21 km double-track tunnel under London. Refurbished stations at Hanwell, Maryland, Seven Kings, Goodmayes, Chadwell Heath, Romford, Gidea Park, Harold Wood, Brentford and Shenfield. 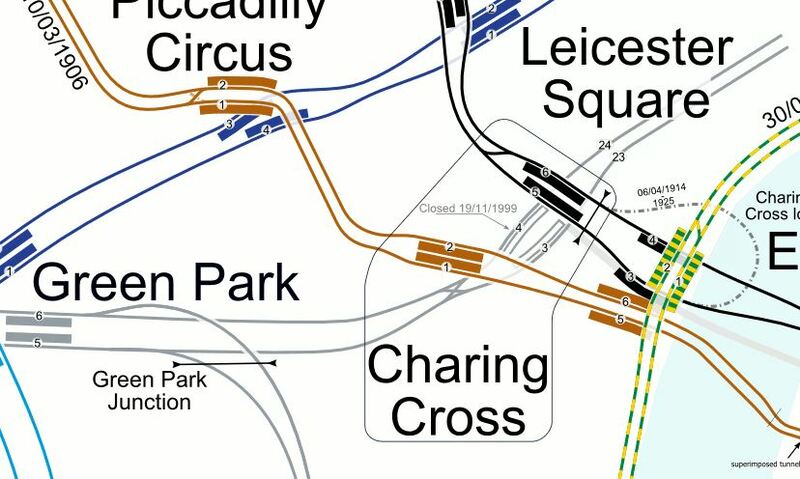 Major interchanges with existing stations at Paddington, Bond Street, Tottenham Court Road, Farrington, Liverpool Street, Whitechapel and Stratford. New stations at Custom House, Canary Whar, Woolwich and Abbey Wood. Some parts are easy, but a lot are very difficult. I believe that certain factors could be reducing the pool of workers available to Crossrail. Less workers than needed would obviously slow the project. Having to pay more than budgeted to attract or keep workers will also raise costs. My thoughts on what is causing a possible shortage of specialist workers follow. If you own a site or a building, near to one of Crossrail’s stations, then your property will substantially increase in value, when the line opens. Walk past any of the Crossrail stations in Central London and some further out and you will see towers sprouting around the station entrance like crows around a road-kill. Developers know how to cash-in on the best thing that has happened to them since the Nazis flattened acres of Central London. New sites are also being created over several Crossrail stations including Moorgate, Farringdon (2 sites), Tottenham Court Road (2 sites), Bond Street (2 sites) and Paddington. But do all these extensive developments, mean that there are not enough sub-contractors, specialist suppliers, electricians, chippies, air-conditioning engineers, plumbers and other trades to do all the work available in London? I also suspect a developer, building an office block to the world’s highest standard could pay better and faster, than a Crossrail supplier under pressure. Working underground or in mining is dangerous. In the 1960s, women were totally banned from working below the surface. It must have been around 1970, when I met one of ICI’s archivists; Janet Gornall, who a few years previously had organised storage of their masses of historical documents, in the company salt mine at Winsford. The mine is still used for document storage, by a company called Deepstore. Health & Safety found out that Janet would be supervising and indexing the storage underground, so that if any document was required, they could be easily retrieved. This caused them to give the scheme a big thumbs down. In the end a simple solution was found..
As the boxes came up from London they were piled up in a large building on the surface, in the position Janet wanted them underground. The pile of boxes was then moved underground and stacked in exactly the same way. Nowadays, anybody can work underground, but they must have training and be certified for such work. Crossrail thought the number of certified underground workers might not be enough, so they set up the Tunnelling and Underground Construction Academy (TUCA) at Ilford. This article on the Crossrail web site is entitled A Legacy To The Construction Industry. It is now part of Transport for London. It was funded by Crossrail and the Skills Funding Agency. TUCA is Europe’s only specialist soft-ground tunnelling training facility. I wrote about TUCA in Open House – TUCA, after a visit in 2012. I was told on my visit, that the Swiss have a similar facility for rock tunnelling and that there were plans for both academies to work together. Trainees from all over the world would get training in an exotic Swiss mountain and then go on to enjoy the wonders of Ilford. But at least they’ll be safe workers for all types of tunnelling. I do wonder if some of the Crossrail delays has been caused by a lack of properly trained underground workers, as now the tunnelling is completed, many have moved on to the next project. The Thames Tideway Scheme is a £4billion scheme to build a massive sewer under the Thames to clean up the river. Many Crossrail engineers, tunnellers and workers are now working on the new scheme. Stuttgart 21 is one of numerous mega-projects in Europe. Many of the workers on Crossrail were originally from Europe and now with the uncertainties of Brexit, some must be moving nearer home,to work on these large European projects. Don’t underestimate, the effect of the Beast From The East last winter. Skilled personnel have always gone to places like the Middle East to earn a good crust. With Crossrail under pressure, how many of these key workers have gone to these places for the money? I wouldn’t be surprised to find that a shortage of specialist workers is blamed for the delays. We are working around the clock with our supply chain and Transport for London to complete and commission the Elizabeth line. Fairly bland, but does the supply chain include specialist suppliers and workers, which are under severe pressure from other projects to perform various works? It’s probably true that there is only a finite pool of these companies, tradesmen and workers and at least some of the best will have been lured away. In this article in the Architects Journal, which is entitled Crossrail Delayed Until Autumn 2019, this is said. Crossrail then revealed in February that it had overspent its budget for the year to 30 March 2018 by £190 million. At the time TfL said works at Whitechapel station, designed by BDP, and Farringdon station, designed by AHR, were completed later than expected, and there were delays to work at Weston Williamson’s Woolwich station and John McAslan + Partners’ Bond Street station. I’ll look at Whitechapel station as an example. You don’t need to be an expert to figure out that Whitechapel station is running late. Look at all the blue hoardings. I know this only shows what is visible to the public. The Crossrail platforms deep underground could be ready. The main entrance to the station is still shrouded in plastic. The escalators to get down to Crossrail, will be between the two District/Metropolitan Line platforms. 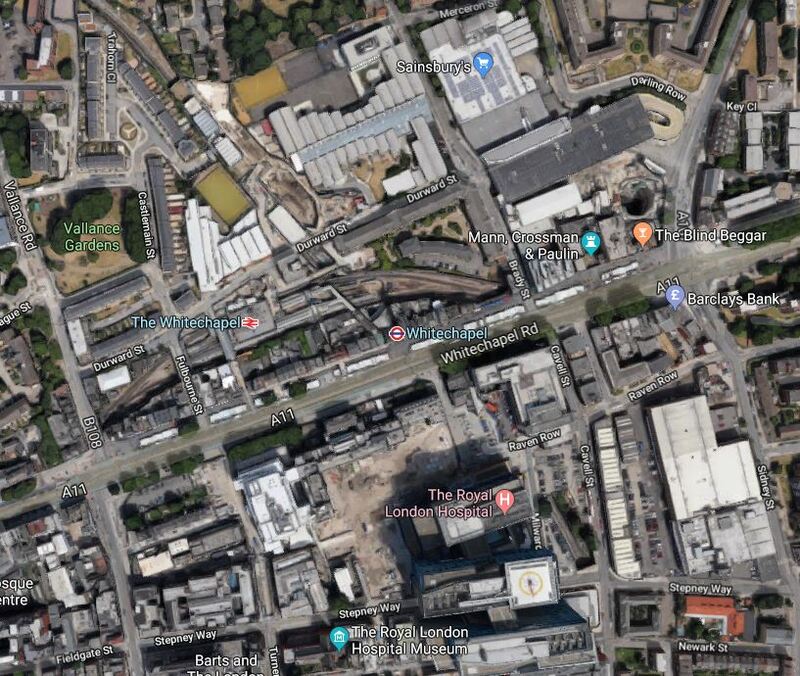 This Google Map shows the area of Whitechapel station. Note how the site is hemmed in, by important buildings including a Sainsburys supermarket and Swanlea School. See An Innovative Use Of The School Holidays, for an insight about how the builders of the station coped with the lack of space. I also feel that Whitechapel is an incredibly complex station to build. It is crossed by two important railways; the District/Metropolitan Line and the East London Line. Innovative techniques from the coal mining industry had to be used to dig the escalator tunnel. Whitechapel will be the station, where passengers change between the two Eastern branches. I do wonder, whether a different design would have been easier to build. For instance, could Sainsburys have been paid to shut their superstore and that site used to build the station? But Crossrail has chosen a design and now they must build it. The new Class 345 trains for Crossrail are an almost totally new design called Aventra by Bombardier, that I believe has been specifically created to make the operation of Crossrail as efficient as possible. The trains must have something about them, as since launch they have attracted five more substantial orders, from five different operators. The introduction into service of the Class 345 trains,has been reasonably straightforward, but not without some issues. But I do question, the launching of Aventra trains solely on a line as complex as Crossrail. Would it have been easier to have built the Class 710 trains first and thoroughly debugged them on the Gospel Oak to Barking Line. But then that electrification was late. Crossrail needs trains to have four different types of signalling. I know that as Crossrail runs on other lines with these signalling and going to a single system like ETCS would need to the changing of signalling systems on much of the railways in the South-East and the trains that use them. It appears that there are problems for the trains running into Heathrow and one of the reasons for the Crossrail delayed opening, is to allow more time to test the trains and the signalling. From my experience of writing complex software systems, where my software needed to interface with two operating systems, I know that you can never put too much time into testing complex systems. So where is the dedicated test track, where trains can simulate the signalling of Crossrail routes, day in and day out? I believe that not enough time and money was allocated to test this complex system. Crossrail has found out the hard way. A lot of European nations are ordering new trains and the UK is probably ordering more than most. Reading the railway stories on the Internet, there are lots of stories about trains being brought into service late. And not just in the UK, but in Germany and Italy for example. Crossrail identified that there was a need for a training academy for underground workers. Did anybody do the calculations to make sure, there was enough test tracks for all the trains being built in Europe? However, it does look as though Wales is coming to rescue Europe’s train makers, as I describe in £100m Rail Test Complex Plans For Neath Valley. I suspect Crossrail wish this test complex had been completed a couple of years ago. For successful completion of projects on time and on budget, there must be enough resources. I believe that, when the lateness and overspend on Crossrail is analysed, shortage of resources will be blamed. Shortage of people and suppliers, that has not been helped by other projects taking advantage of new opportunities offered by Crossrail. Shortage of space for work-sites at stations. Shortage of places to fully test trains and signalling. I suspect that the last will be the most serious. In an excellent article in today’s copy of The Times entitled Leavers Have A Cheek Trying To Block HS2, Hugo Rifkind says this about Crossrail. You think we’ll remember, 50 years from now. that Crossrail took six months longer than expected? Rubbish. London will rest on it like a spine and boggle that we ever managed without. I think Rifkind is right. Will Hutton has written this article in the Guardian, which is entitled Don’t Moan About Crossrail. Once Complete, It Will Be A Rare Triumph In Our Public Realm. Let’s sing a different tune. The railway line, more than 60 miles long, linking Reading and Heathrow in the west to Shenfield and Abbey Wood in the east – adding 10% to London’s commuter rail capacity – and set to carry around 200 million passengers a year, will be a fantastic achievement. Its 13-mile-long tunnels run more than 100ft under the capital’s streets, navigating everything from underground sewers to the deep foundations of skyscrapers with superb engineering aplomb. The longstanding reproach is that Britain can’t do grand projects. Crossrail, now christened the Elizabeth line, is proof that we can. He then goes on to criticise the structure of the construction project, the salaries paid and the current Government. But I suspect that in a few yeas time, Hutton, Rifkind and myself could have a quiet pint and say Crossrail got it right. It’s not as if, no new transport developments won’t happen in the time before Crossrail eventually opens in Autumn 2019. These trains will be providing extra capacity. New Class 717 trains will be running on the services to and from Moorgate station. New Class 710 trains will be running on the Gospel Oak to Barking Line. New Class 710 trains will be running on the Lea Valley Lines to Cheshunt, Chingford and Enfield Town stations. New Class 710 trains will be running on the Watford DC Line. Cascaded Class 378 trains and new Class 710 trains will be running extra services on the original circular service of the London Overground. More Class 345 trains will be providing all of Crossrail’s services to Heathrow and Shenfield. New Class 720 trains or something similar or older, will be providing four trains per hour (tph) between Stratford and Meridian Water stations. Note that before the end of 2019, nearly a hundred new trains will be delivered. There will be some new or rebuilt stations. This list may contain other stations. There will also be Underground improvements. The Central Line Improvements Programme will increase capacity and reliability on the Central Line. The Metropolitan Line is being upgraded with new signalling. Up to ten Underground stations may be made step-free before the end of 2019. The improvements to the Central and Metropolitan Lines, through Central London will compensate for the delaying of Crossrail’s core tunnel. I have to ask questions. Will The High Meads Loop Be Used? This would provide an excellent interchange between the following services. Local services to Hertford East and Bishops Stortford stations, including the new STAR service, along the West Anglia Main Line. Stansted Express and Cambridge services to and from Stratford. Fast Greater Anglia services to Chelmsford, Colchester, Southend and further, along the Great Eastern Main Line. Crossrail services between Liverpool Street and Shenfield. There is also only a short, but tortuous walk to the Jubilee Line for London Bridge and Waterloo stations and Central London. Based on the experience of the Wirral Loop under Liverpool, which handles sixteen tph, I believe that the High Meads Loop could handle a substantial number of trains, that instead of using the crowded lines to Liverpool Street station, would use the new uncrowded route from Tottenham Hale to Stratford via Lea Bridge station. Moving services to Stratford from Liverpool Street would also free up platforms at the major terminus, which could be used to provide extra services on the Great Eastern Main Line. The extra capacity might also enable the lengthening of the Crossrail platforms at Liverpool Street to be extended, so they could take full-length Class 345 trains. No new extra infrastructure would be required at Stratford, although in future, a platform to connect the loop to Stratford International station would be nice. I will be very surprised if the High Meads Loop is not used creatively in the future. Will Some New Pedestrian Tunnels At Stations Like Liverpool Street And Paddington Be Opened? I use Moorgate and Liverpool Street stations regularly. There are blue walls everywhere, behind which the Crossrail infrastructure is hiding. I do hope Crossrail and Transport for London are looking at the possibilities of using completed infrastructure to create new walking routes in stations to ease congestion. Crossrail was designed to be opened in four phases over two years. I am drawn to the position, that because of various resource shortages and the testing of trains, perhaps the project could have been arranged as perhaps a series of smaller projects delivered over a longer period of time. In the Wikipedia entry for City Thameslink station, there is a section called Future Proposals. 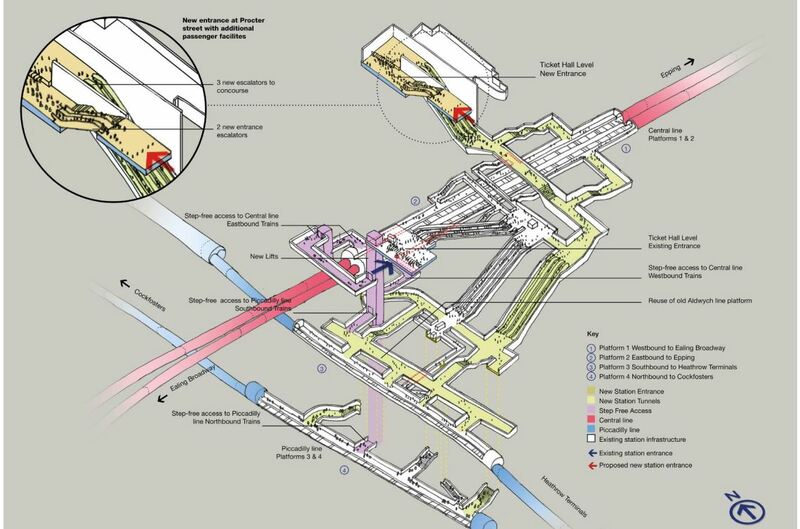 An underground passageway linking City Thameslink to St Pauls tube station to provide an interchange between the London Underground Central line and National Rail services on the Thameslink (route) has been suggested by London TravelWatch in a report in 2014 which suggested it would benefit passengers travelling from the Central Line catchment to Gatwick and Luton Airports. St. Paul’s tube station does not have the best access, with two sets of escalators to get to the Easttbound platform, which is underneath the Westbound one. This picture shows the lobby at the bottom of the second set of escalators. The Eastbound platform is through the opening on the left. Could a tunnel to the West be built from this lobby? This map from carto.metro.free.fr shows the layout of lines at City Thameslink and St. Paul’s. It would appear that a pedestrian tunnel could be bored from the Western end of the platforms at St. Paul’s to connect to the Northern end of City Thameslink. A travelator could be included. It would create an accessible route into St. Paul’s station. Intermediate entrances could be provided to give access to important sites like the Western end of St. Paul’s cathedral. Property development between the two stations will probably be the catalyst to get this link built. These pictures show Paternoster Square, which lies to the North of St. Paul’s cathedral. I wonder if provision was made for an entrance, when the area was redeveloped around twenty years ago. It would surely be an ideal place for an intermediate step-free entrance to any pedestrian tunnel linking St. Paul’s and City Thameslink stations. Done properly, it would do the following. Add step-free access at one of London’s most important stations for tourists. Create a link between Thameslink and the Central Line. Create a shared entrance to both stations in the Paternoster Square area. Obviously, the figures would have to add up.